While being on time is appreciated, Brazilians understand lateness if explained sufficiently. If the delay is significant, call or email ahead as a courtesy to the other party. However, if meeting someone more senior then ensure that you are on time – just don’t necessarily expect the same from them. 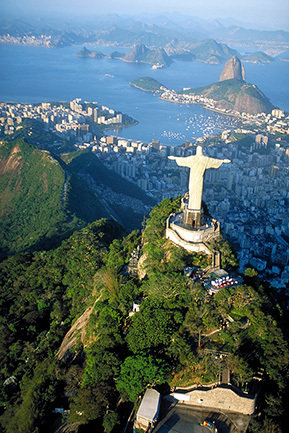 Apparel in Brazil’s business world is consistently formal – think dark suits, light dress shirts and often a tie. Unlike in Europe and the US, the dress code does not typically relax in warmer weather when dealing with South Americans; American and European expats will be more understanding. Brazilians are known to prefer to discuss business over food. Consequently, many meetings take place in restaurants where possible. Locals also like to show their knowledge of nearby restaurants, so make use of the opportunity to try new and interesting food when having meetings in Brazil. Men typically greet each other with a handshake, while greetings involving women tend to be air kisses on each cheek in the European style. The total number of kisses varies from two to three, depending on region. Brazilians prefer to ease into the subject matter that necessitated the meeting, instead starting with pleasantries and casual conversation. The topics for this are much the same as when meeting unfamiliar people and acquaintances elsewhere, such as sport, family or even the weather. You might also wish to comment on your experience of Brazil so far before moving onto business matters. It is better to be somewhat circumspect in some matters, as being overly director straightforward might be perceived as aggressive or even offensive. Many people you will meet in Brazil, particularly in Sao Paolo, will speak English to a decent standard. However, as English is their second language they may not always understand perfectly, but Brazilians typically do not interrupt for fear of upsetting the flow of the conversation. Therefore it is useful to provide written confirmation of what was agreed verbally in the meeting to ensure that all parties have time to digest what was said. Hopefully this guide will serve you well if you end up working in Brazil or you are thinking of starting a business in Brazil. Have you done business in Brazil previously? If so, does this list match up with your experience? And what would you add? Share your knowledge by leaving a comment below! « What do Minecraft and Turkey have in Common?